It’s another exciting post in the kitchen today. Ha. 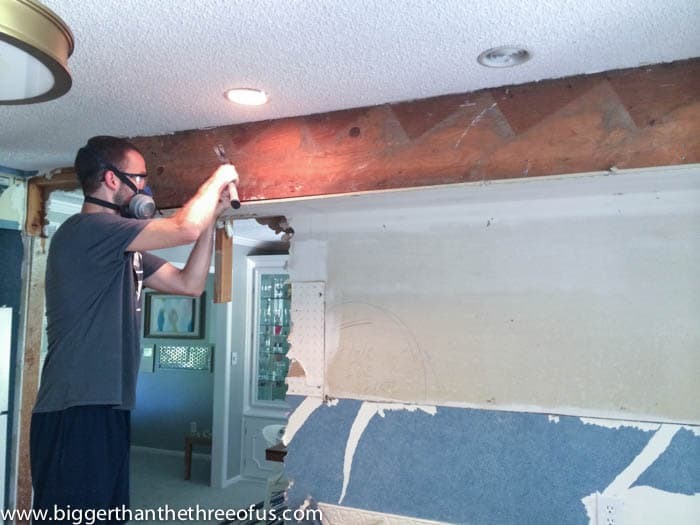 I think last time I said that, I had posted how to repair popcorn ceiling around an old light. Well, to be quite honest, it is pretty exciting around here in the kitchen. Any progress is great progress in my book. Let’s jump right to it, shall we? 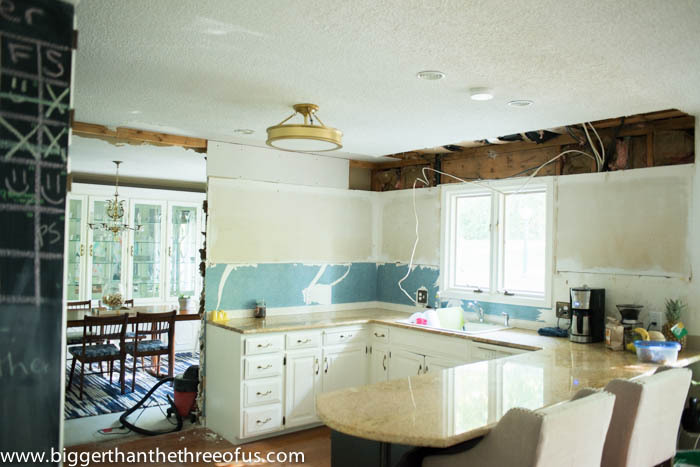 If you remember we had these soffits (or bulkheads or headers – whatever you want to call them) above all of our kitchen cabinets. 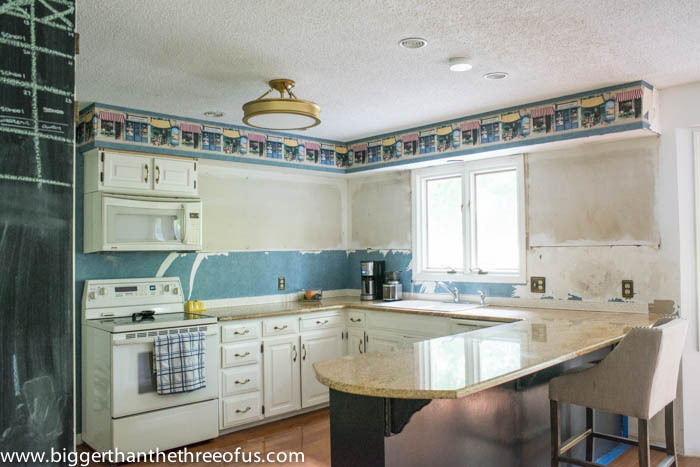 Once we moved the stove to the other wall, they were even move noticeable. It was always in the plan to take them down, so we dove right in. The first thing we did was to make sure we didn’t have any electrical in the main soffit. We cut an opening in the end and shined a flashlight to check. The first soffit that we worked on was clear of electrical. Next step, was to pry the drywall off the front of the wood. This allowed us to actually see where the nails were holding the soffit in. Luke and I took turns during this part (both wearing safety glasses and the mask). 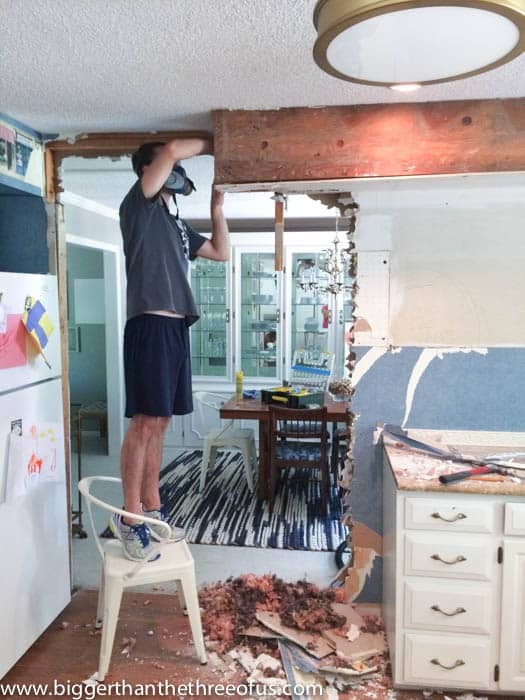 Breaking that drywall is no walk in the park, it gets everywhere!! 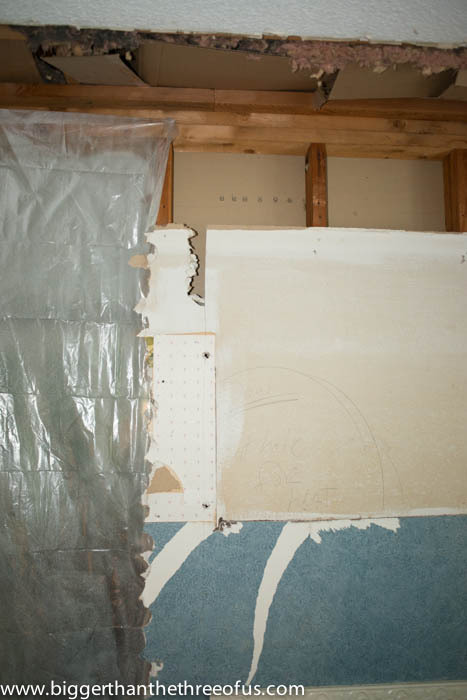 Once we had the drywall off, we decided to scoop out the insulation. We bagged it and saved it so that we could put it back in the attic at the end. From here, it was slow moving. Luke worked on getting old nails out and prying boards off. The front board was worked on first and then the 2×4’s that supported the front. Overall, I would say that this one section took about 4 hours. When we got the first section off, we realized “oh crap, we have no idea what to do next and it’s the end of the weekend.” Ha. So, my Grandpa stopped by and gave us a GREAT tip. 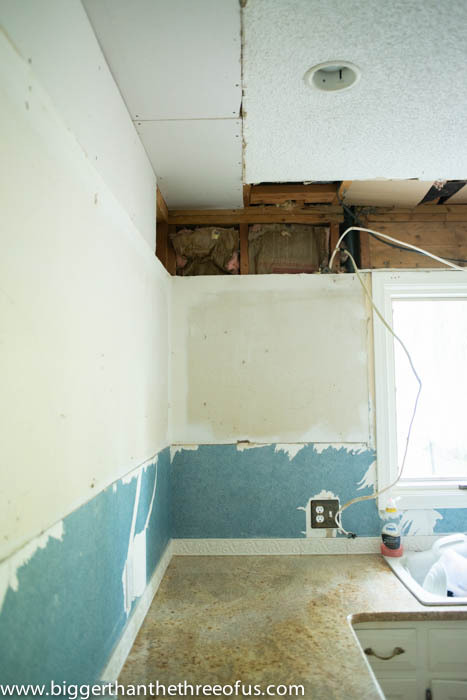 Cover the opening to the attic with cardboard until you are ready to put drywall up so that you don’t loose as much heat/air. I would have never thought of that. So, Luke ripped up some boxes and we did that. 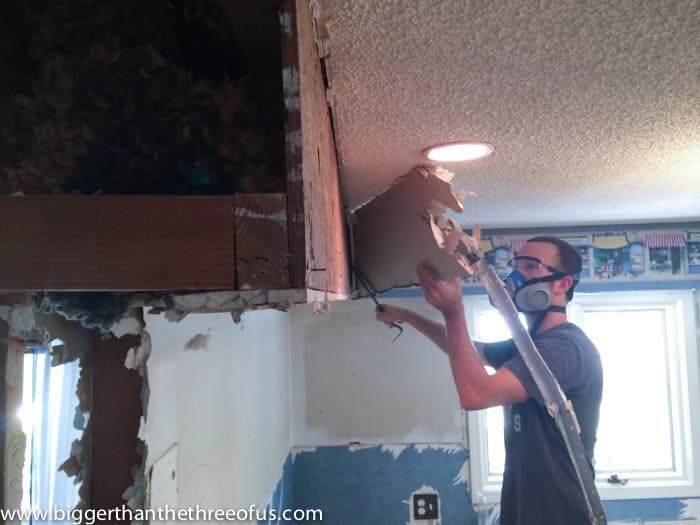 Over the following week, we worked on the rest of the soffit (well in the U-shape of the kitchen – we still have the soffit above the fridge and stove at this point). Over the window, we knew there was electrical so we opened the front of the soffit first to spot the electrical and then worked around it. We knew we were going to have issues with the electrical and, oh boy, are they being issues! The lines ran (see below) don’t have enough wire to snake them up through the wall. They are curved which allows us no room to put the drywall in. That’s a problem for another day though. 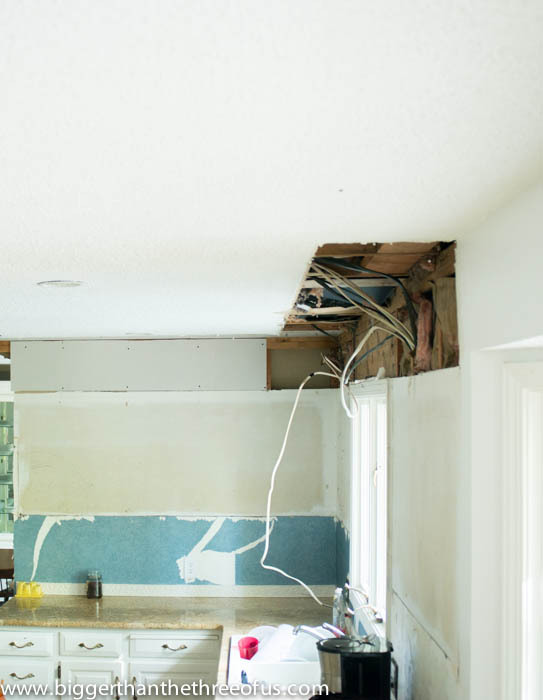 When we saw that the wires were going to cause a problem, we decided to get a piece or two of drywall in place (just because I wanted to see how hard it was). It wasn’t hard at all! We only got the one wall done, because we have to work on the electrical issues but I’m excited to know that the drywall installation will not cause us any problems. So, not much in terms of pretty… but I’m happy!